Are you prepared for Mother’s Day 2019? Have you bought Mother’s Day flowers or Mother’s Day presents, already? Do you need any unique Mother's Day gift ideas? All will be revealed in this blog, please read further. In the United Kingdom, we celebrate Mother's Day on the fourth Sunday in Lent, and as Christian religious tradition instructs, exactly three weeks before Easter Day. 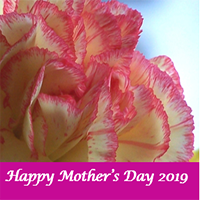 In 2019 Mother’s Day falls on Sunday, 31st March 2019. Mother’s Day stems from a centuries-old practice in which people would travel from far and wide to return to their ‘mother church’ for a special service during Lent. People would also reunite with family from their hometowns and it later became known as ‘Mothering Sunday’, with children often picking flowers for their mothers on the way to church. Momtastic recommends, giving mum the day off, breakfast in bed or an inter-generational family get together. However, possibly one of the most unusual ways to celebrate Mothering Sunday is in Yugoslavia. Children creep into their parent’s bedroom first thing in the morning, and tie their mother up! This sounds bizarre, but to be released, it’s compulsory for the mother of the family to present her children with gifts as soon as she wakes up. They say that this harmless fun, but I know that most mothers in this country would balk at this idea! My advice for any son or daughter is not to tie up your mother for Mother’s Day. Instead, you need to purchase unique Mother’s Day gifts from Brilliant Wall Art, the Midlands premier wall art and home accessory specialist. This is a much safer option. Brilliant Wall Art are also at Worcester UpMarket every Saturday. You can also see us at Bewdley Market on the first and third Sunday of every month. Brilliant Wall Art wish all mothers throughout the world, a Happy Mother’s Day. After all, where would we be without you?